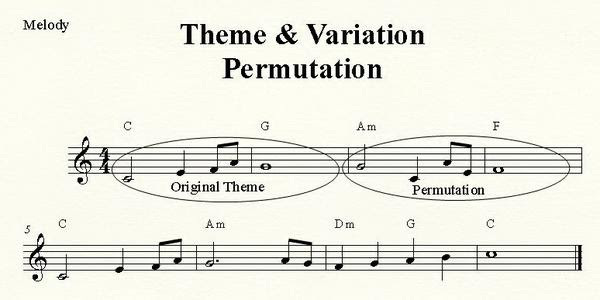 How to Write for Theme & Variation – Permutation and Same Rhythm with Different Pitches. Last time I discussed and showed you how “Inversion” and “Retrograde Inversion” were used in arranging melodies. In this tip we are going to continue with “Permutation” and using the “Same Rhythm with Different Pitches”. As you will hear in the two audio files above I have used the same pitches but put them into a different order. However both examples still contain a motive so they can be used in conjunction with the original melody. The rhythm is the same as in the original theme but new pitches are assigned to each note. This is close to permutation but in this case totally new pitches are used instead of rearranging the original pitches. Try making a melody yourself incorporating these 2 techniques we discussed in this tip. Remember the order of how to compose a theme and variation? 2. Change the original theme in the next two bars using the techniques discussed above. Make sure that it fits in with the original theme before and after. 3. Let the original theme reoccur in bars 5 and 6. 4. In bar 7 make a connecting melody which leads to the tonic in bar 8 and functions as the final cadence. 5. Optional: Make a chord progression which is based on strong beats such as 1 and 3 in each bar.